While Presidential Spokesperson Harry Roque said that this is not a matter of entitlement since the president himself did not avail of the palace to be his abode, so there should be nothing wrong to have Isabelle Duterte’s pre-debut photos taken inside the presidential palace, public opinion begged to differ. “The President is entitled by law to live in Malacañang but opted not to. So his relatives, especially his own (granddaughter), can have their photos taken in Malacañang,” said Roque. However, some said the photo shoot of the young Duterte may have violated Executive Order 310, signed by former president Gloria Arroyo, that prescribes the design and use of the coat-of-arms, seal and flag of the president and vice president of the Philippines, and for other purposes, as one of the photos showed the official seal of the president of the Philippines. The EO Duterte’s ally signed in 2004 said the symbols are exclusively meant for the use of the President and Vice President of the Philippines and no other officials. Beyond what laws may have or have not been violated, netizens and activists make meaning of the photoshoot in the people’s daily lives and current events in the country (e.g. the drug war, homelessness, hunger, poverty, strife post-Marawi conflict, etc.). At the end of their fingertips were 280 characters in social media platform Twitter as quick reactions to the photo shoot avalanched after photos of the December 14 photo shoot were posted online, probably hoping to generate likes and spread good vibes hashtag blessed. Most were in agreement with the observation that it was ostentatious, a display of luxury, power and privilege. And that word that Imelda Marcos being herself put in the English dictionary: imeldific. What are we in power for?" Isabelle Duterte thinks we should focus on important issues. Surely if your lolo thought that your family's "humble lifestyle" was a campaign issue then, then your opulence is newsworthy now. Isabelle Duterte asks all of us to spare her, a 17-year-old person, from hateful comments following a distasteful (and legally problematic) photoshoot. How I wish Kian, at 17, could also wish to be spared from dying under the so-called drug war waged by her grandfather. ISABELLE: I am just a girl standing in front of a boy asking you not to attack me. KIAN: Tama na po! May test pa ako bukas! People can’t help noticing the ‘blood red’ gown. Just in: Presidential granddaughter Isabelle Duterte poses for a pre-debut photo shoot inside Malacañang. Comparisons were made, of course, on who wore it better. Remember how imee marcos partied like a princess in Malacañang? Others were simply just in disagreement with the styling and creatives. Isabelle Duterte having her pre-debut shoot at Malacanang? Tasteless. Netizens can be certain their reactions reached Isabelle. This is my real account, teh. Don't need to show my face to prove a point. Inyo Malacanang? Kapal ng mukha n'yo. your response (or lack thereof) speaks volumes, sis. Others in praise for the photo shoot got a piece of mind from the naysayers as well. There were also tweets in defense of the negative reactions. Si Kris Aquino nga, who's a taxpayer and a Presidential sister got called out for using a presidential helicopter tapos, Isabelle Duterte, who's barely 18 and not even taxpayer can enjoy a life of privilege? Lol, reevaluate your disposition. People asking why we're salty about Isabelle Duterte's photoshoot. Malacanang is paid for by tax payers. We're paying for her photoshoot. And since Roque said, “Gaya siya ng ordinaryong mamamayan na pwede ring mag-picture-picture sa Malacañang [She’s like any ordinary citizen who can take pictures inside Malacañang]” and with the tips from Isabelle herself, netizens looked only happy to oblige. 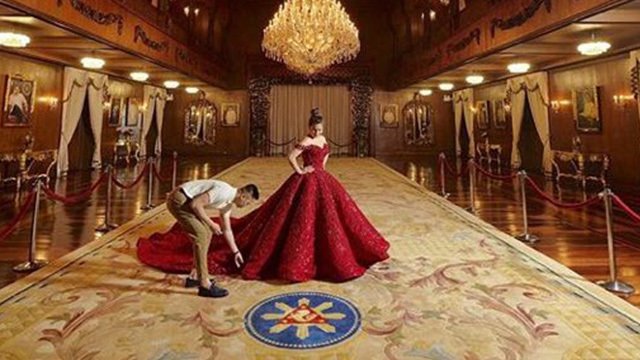 READY NA BA KAYO SA ORG ANNIVERSARY PHOTOSHOOT NIYO SA MALACAÑANG?!?!?! IF PWEDE SI ISABELLE DUTERTE, BAKIT TAYO HINDI???? ANO YUN SIYA LANG PWEDE MAGPALIT NG MAGANDANG DP?????? GANDA SIYA?!?!????? Why not just give the people invitations?